In a major departure from India’s solid waste management policy, NITI Aayog, the government’s main policy advisory body, has stated that biogas and composting are not sustainable disposal solutions because they generate large volumes of residues and by-products. In its Three Year Action Agenda 2017-18 to 2019-20 released in August, the Aayog has suggested that municipal solid waste be burnt to produce energy. As of July 2017, thermal-based waste-to-energy (WTE) plants in India have the capacity to process 5,300 tonnes of garbage and produce 63.5 MW per day. According to a 2015-16 report by the Ministry of New and Renewable Energy (MNRE), this capacity can be enhanced to 1,075 MW by 2031 and to 2,780 MW by 2050. The new policy seeks to increase energy generated from solid waste to 330 MW per day in the next five months, an over 400 per cent increase from the current installed capacity, and to 511 MW by 2018-19. 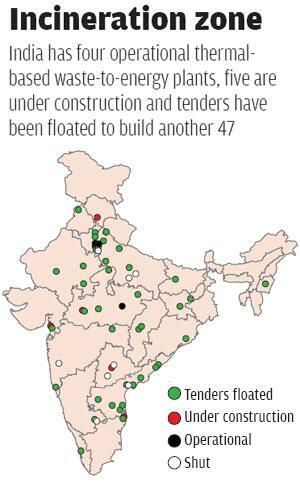 To this end, five WTE plants are already under-construction in the country and tenders have been floated to build another 47. But is this feasible? India’s experience with WTE plants suggests otherwise. As per 2014 estimates of the erstwhile Planning Commission, urban India generates 62 million tonnes of municipal solid waste per year. Of this, only 43 million tonnes is collected, 11.9 million tonnes is treated and 31 million tonnes is dumped in landfills. What’s worse, most of the collected waste is unfit for incineration (see ‘Ill-conceived plan’). There is no countrywide data, but Delhi, for instance, produces 10,500 tonnes of waste a day, of which just 1,300 tonnes is suitable for incineration. The rest can be composted, recycled or processed through biomethanisation. The low calorific value of the waste is due to the presence of a large organic fraction (40-60 per cent), ash and fine earth (30-40 per cent), paper (3-6 per cent) and plastic, glass and metals (each less than one per cent), says a 2011 Central Pollution Control Board report. Since segregation of waste at source in India is minimal, wet waste gets mixed with dry, reducing its calorific value. A 2017 report by GIZ, a German government agency working on waste and sanitation, states that mixed municipal solid waste in developing nations is by its nature different from that in industrial countries and has specific characteristics in every city. This diversity must be considered in any technology assessment. But most of India’s plants burn mixed waste, and even need auxiliary fuel to run their operation. This is one of the reasons behind the expensive power they produce. A unit of electricity produced in thermal or coal plants costs R2-4, while that produced in thermal-based WTE plants costs about R7. No wonder eight of the 12 incineration plants set up in India so far have shut shop and only four are operational (see ‘Incineration zone’). Moreover, as per an order passed by the National Green Tribunal on March 20, 2015, the compostable fraction cannot be used for burning and should be used for compost or biogas. The order also states that the recyclable portion has to be sent for recycling (some products have high calorific value but when burnt they release highly toxic gases) and only the non-recyclable, non-biodegradable waste (textiles, non-recyclable plastic, ceramic) can be sent to these WTE plants. “Not only are our processing capacities low, we haven’t shifted our focus from using land for dumping waste to using it for processing waste in a decentralised manner,” says Shibu Nair of Thanal, a non-profit based in Kerala, working on decentralised waste management options. The concept of producing power from waste first emerged in the 1980s when disposal of waste became a colossal problem for municipal authorities. But the first plant set up in Timarpur in Delhi in 1986 was shut soon after its commissioning due to costly power it produced and shortage of suitable waste. Still several governments were seeing such plants as a magic solution, with many countries in the West running waste-to-energy projects successfully. The first time waste-to-energy plants came under scrutiny in India was in 2005 when the Supreme Court asked a 14-member committee to look into the non-operational plants in Lucknow and Hyderabad. In 2007, the apex court asked the Ministry of New and Renewable Energy to set up five plants on pilot basis. Of the five plants set up, two could not be completed due to shortage of funds and one shut down within six days since the technology was unsuitable. The two operational plants are in Delhi but have not had much success. People have protested setting up the plant at Okhla and took the issue to court. The other plant, at Ghazipur, runs for only 15 days a month because of unsuitable waste feed and high running costs. Officials, however, are still of the view that waste-to-energy plants can be run on unsegregated waste. “The proposed policy neither takes into account the failure of incineration plants, nor the success of biomethanation plants in several Indian cities,” says Bharati Chaturvedi, founder and director, Chintan Environmental Research and Action Group, a Delhi-based non-profit. “It can also destroy the livelihood of 1.2 million people employed to collect and segregate waste in the informal sector,” says Shashi Bhushan, president of All India Kabadi Mazdoor Mahasangh. “About 70 per cent of our waste is organic and burning it using extra energy is ridiculous. The solution for organic waste is biological disposal, not thermal. We need to opt for composting,” says Nair. “From decentralised composting in condominiums to zero waste campuses, there have been many success stories. Decentralised waste management is the future,” adds Chaturvedi. I have a simple question .If incineration is successful in developed countries then why it can not work in India.I remember having seen a mobile incineration plant moving on the busy roads of Nagoya (Japan) collecting and processing solid waste from the shops and homes way back in 1982. It is surprising that we are unable to operate even a stationary plant in our capital city in the second decade of the twenty first century. The problem lies in our attitude, behaviour and skill rather than in technology. The point is nothing works where politicians and bureaucrats are involved in conjunction. It's simple science. The waste composition needs to support incineration. To generate energy from incineration we need enough calorific value, which is lowered due to poor source segregation practice in the country. Understanding where its needed in the country instead of putting these plants up like a magic solution is what should be challenged. I fully agree with views of Sh. Nair, reproduced below. Solution needs integrated efforts, not a single option. It may start with Reduction to waste, compulsory segregation, use of all kinds of biological means especially employing EARTHWORMS (केंचुआ) to degrade any kind of organic waste & in turn get harmless organic manure, and lastely bringing local solutions depending upon the situation at different locations /cities. Also making SWM as integralcomponent of Swach Bharat. If waste is not managed now it will become a new man made DISASTER. Our logo should be nothing is waste in this earth, everything is resource. About 70 per cent of our waste is organic and burning it using extra energy is ridiculous. The solution for organic waste is biological disposal, not thermal. We need to opt for composting,” says Nair. “From decentralised composting in condominiums to zero waste campuses, there have been many success stories. Decentralised waste management is the future,” adds Chaturvedi. Since 1997, Columbia University has studied all existing methods for managing post-recycling urban wastes. Only two have been adopted widely around the world: Landfilling and combustion with energy recovery (also called Waste-to-Energy or WTE). In a major effort to reduce landfilling, China has built over 200 WTE plants in this century and India is making a valiant effort to increase its WTE capacity, as reported in this article. However, the Okhra WTE plant in Delhi had to deal with very limited capital and a government subsidy that did not materialize. For example, the storage bunker of this plant is not covered, as is the case of the Jabalpur WTE, and all modern WTE plants, where the bunker is under cover and negative pressure. Thus, the bunker air is used for combustion and there is no emission of odors to the environment. Your article implies that the Okhra situation is replicated at other Indian WTE plants. Even in its imperfect condition, the Okhra WTE is environmentally much preferable to the landfilling that uses up land and affects public health in Mumbai and many other Indian cities. It is plain that Columbia university, for all its vaunted research, has little understanding of the situation in India or that at Okhla (at least get the spelling right, it's not Okhra). The plant burns unsegregated waste at a proximity of 30 meters from government-built residence, using diesel as auxiliary fuel. It started out as an 'integrated waste management plant' but quietly dispensed with specifications in the EIA that RDF and biomethanation .would be important components. It was denied government subsidies and also an ADB loan because of the many illegalities that surround it - zoning regulations under the Delhi Masterplan, serious deviations in approved technology, failure to have any outreach to the residents, no proper disposal plan for toxic flyash and bottom ash and so on. But, it did manage to get 27 acres of prime real estate from the government. The hapless residents are frequently showered with soot and toxic ash as result of which th eplant was issued a show cause notice - rather reluctantly - by the regulatory bodies CPCB and DPCC. The plant is situated close to the Okhla Bird Sacntuary and Wildlife Park but has no approvals from the forest ministry. The acid in the emissions endanger the marble on historic monuments like the Humayun's tomb as well as the iconic Bahai Lotus temple. It is sited smack in the middle of three major hospitals which have recorded protests that it is endangering their patients with the smoke, smell and noise. Wthin 50 meters is a large women's hostel run by the Jamia Milia Islamia central university. Worst of all the plant has been claiming carbon credits from UNFCCC since 2011 on the grounds that it is using RDF - when it does not even have the equipment to produce it! If this is the model fo rincinerators in this country God help us all! Sir if government really want to solve the problem of garbage dumpingground and Energy Solutions from MSW CONVERT TO ENERGY PELLETS WITH IN 6O MINUTES WITHOUT SEGREGATE. ZERO LANDFILL AND ZERO POLLUTION U.S PETENT TECHNOLOGY TO CONVERT GARBAGE TO ENERGY PELLETS. LOWEST COST.